Xombies 3D is an incredibly strange film. 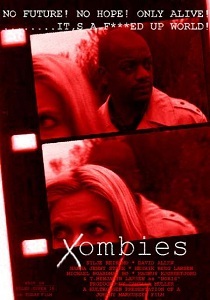 Set in a post-apocalyptic world full of zombies it follows a man and a woman with a prisoner in tow. They are being pursued by a couple of heavily armed maniacs in the employ of some kind of evil Nazi. It's basically a chase movie with a ton of violent zombie action. The visual style is completely unique as the film often blends several layers and is packed with dated 3D effects. It almost has a comic book aesthetic mixed with an old school video game look. It's a low budget film so the acting is ropy, the plot and dialogue are bizarre and the humour won't appeal to everyone. It is very inventive and very, very weird.